Ice-cream is a delicious, wholesome, nutritious frozen diary product loved by children. Even though ice-cream has sweetening and flavoring agents it has some nutritional significance too. Yes, probiotic icecreams – a treat to chubby cheeks. PROBIOTICS are live bacteria and yeasts that are good for your digestive system. They can help balance your “good” and “bad” bacteria to keep your body working the way it should. Probiotics create a biofilm which act as a protective lining for times and keep the pathogen away. Dental cavities are the main oral health issue. When you eat Sugary foods or sip Sugary Drinks for a long period of time, Bacteria use that sugar to produce Acidic environment which attacks your teeth. Probiotics have an ability to survive in such an acidic environment. 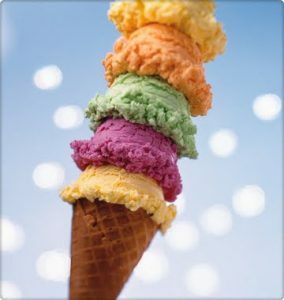 Probiotic ice cream contains probiotic strains which reduces the level of bacteria in mouth responsible for tooth decay. Probiotics are available in other forms too like milk, yoghurt and other supplementaries.